Is the veggie tray you brought to your child’s preschool Valentine’s Party going untouched? Are you tired of watching the healthy snacks get passed over for the sugar and fat packed goodies? Well here is a fantastically healthy, sweet treat to share with your little ones and their friends. AND it’s super easy to prepare. Jeremy goes to the most awesome preschool 2 days a week and of course, they celebrate all the holidays. And of course, every parent brings some sort of goodie or treat to share with the other kids at school. Most of the parents are like me, and take the time to make a treat to share. Also just like me, most of the parents work and don’t have as much time to devote to homemade goodies. Sometimes, sugary, prepackaged, processed snacks make their way to the table. I don’t mind Oreos or Reese’s Peanut Butter Cups once in a while, but I don’t want that to be the only option. I usually like to bring non-food treats for the kids but I just bought a huge flat of delicious organic berries. Chocolate covered strawberries are so simple and surprisingly healthy. A large strawberry has around 9 calories. One ounce of chocolate has around 150 calories, but it won’t take a whole ounce to cover your berry. You can make a luxuriously, lower calorie dessert in minutes. AND what would make it even better? Putting it on a STICK of course! Wash and dry you strawberries as good as you can with a towel. Place them in the refrigerator for at least an hour to get nice and cold. This way, the chocolate will harden faster and there will be less chance of the chocolate running or dripping. 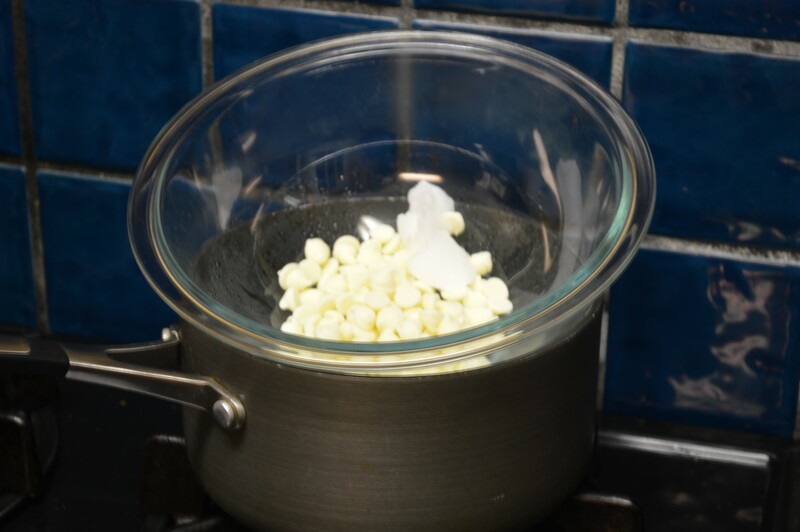 Set up your double boiler and add your white chocolate chips and coconut oil. Bring to a gentle simmer and stir until melted and smooth. Next, pull your strawberries from the refrigerator and remove just the stem. For a “bouquet” I wanted to keep the leaves on the berries, but if you prefer, you can removed the stem and leaves altogether. Now you can insert your lollipop stick. 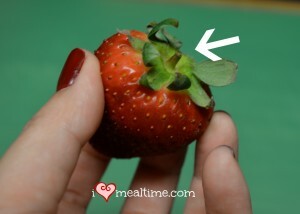 Start at the base of the strawberry and insert the stick into its middle, making sure not push all the way through. Now you are ready to dip. Dip your strawberry into the melted chocolate mixture and swirl until you get the coverage you desire. 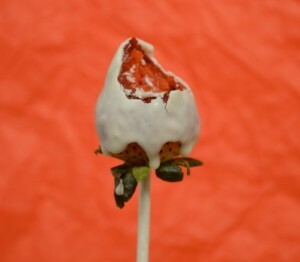 If your lollipop stick seems “loose”, dip the end of the stick into the chocolate and reinsert into the berry. Then let it cool before you dip it. That usually holds the strawberry onto the stick well. Once your berry is covered in chocolate, you gotta let it harden. For this I like to use floral foam cubes I get from the dollar store. 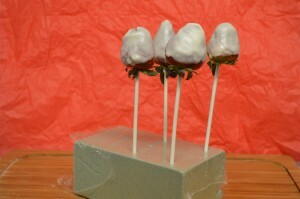 This way, the chocolate can harden without having to set down the strawberry. That’s it! They are done! 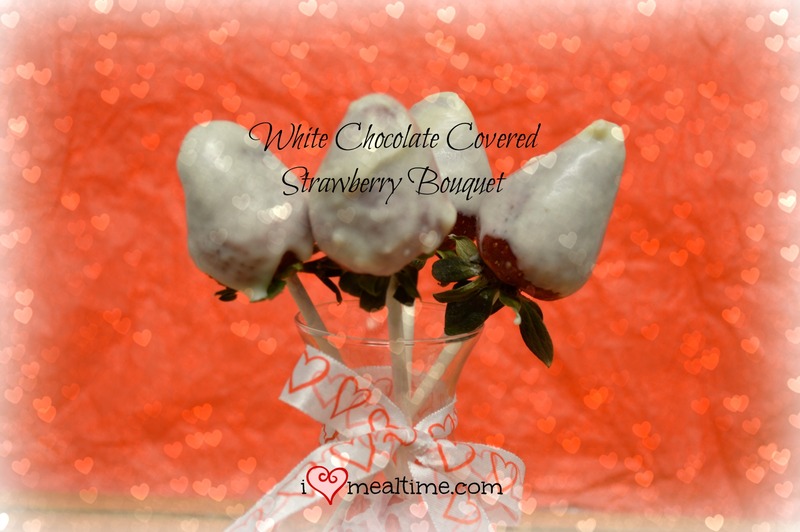 You can individually wrap them with candy bags and ribbon for “strawberry lollipops” or place them in a vase for a “bouquet.” The chocolate dipped strawberries are best if eaten within 24 hours. Refrigerate for longer storage, but serve at room temperature for greatest flavor. I always enjoy feedback. Leave me a comment. ENJOY! A super-easy, three ingredient treat that is not only yummy but healthy! Rinse and pat dry strawberries, then refrigerate. Prepare a double boiler. (You can make this using a small pot and a glass pyrex bowl large enough to sit on top of the pot without falling in. Shallowly fill the pot, set the bowl on top, and bring to a gentle simmer. Add chocolate chips and coconut oil to bowl. Once this starts to soften, gently stir mixture until all of the chocolate and oil is melted and smooth. 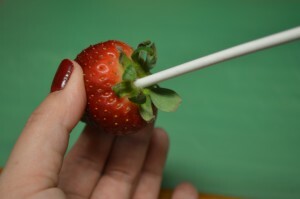 Prep your strawberries for the lollipop stick by removing the stem only, and not the leaves. (I left the leaves for garnish, but you don't have to keep them if you only want the strawberry). Insert the lollipop stick starting at the base of the strawberry into its middle. Be sure not to push all the way thru. Turn off the heat to the chocolate mixture. Dip and swirl your strawberries in the mixture until coated to your liking. Insert the end of your lollipop stick into the styrofoam cube and let your chocolate harden. Repeat with the rest of your berries. Enjoy.